The roles were switched at the All Saints Soup Kitchen and Food Pantry on Saturday, May 19, 2018. 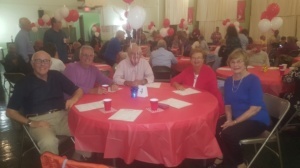 Those who usually serve our soup kitchen and food pantry guests got a little service of their own at the annual Volunteer Appreciation Mass and Dinner. 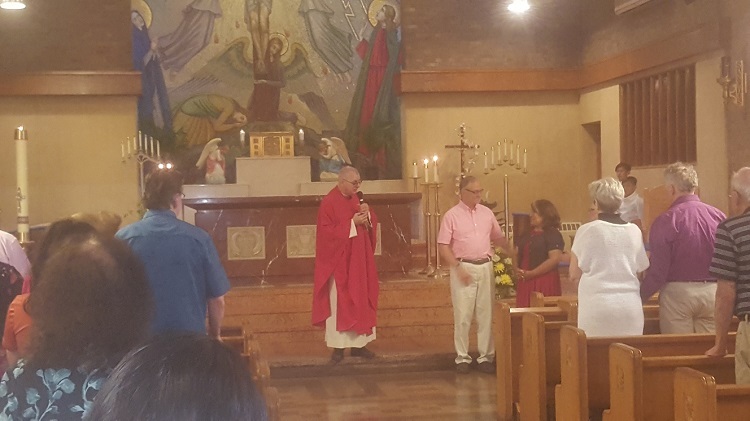 About 100 volunteers attended the Mass at St. Gabriel Parish, celebrated by Fr. Marc Gawronski. Dinner followed at the All Saints Soup Kitchen and Food Pantry dining hall. Thanks to Robert Schultz of “Bob’s Angels” for catering a delicious dinner of roasted chicken, pulled pork and all the fixings. The All Saints Soup Kitchen and Food Pantry is a ministry of Catholic Charities of Southeast Michigan. Support CCSEM this Valentine’s Day! I heartily recommend the (Adult Day Health) services to anyone seeking options in the care of a loved one. The (Adult Day Health Services) program provides my mother with the opportunity to socialize and participate in activities which add enrichment to her life. When I first visited, I was impressed by the cleanliness of the building and the calming atmosphere present. That has not changed in three years. I am confident that my mother is in good hands when I need someone to take over Mom's care for a few hours. My mother was a client of the Adult Day Health Services program for three years. During that time, the staff treated my mother with the utmost respect, compassion and care. I really appreciate the help and hard work [my worker has] done for my family, she was a great help, Thank you! I am a return client. … she has been a great counselor, confidante, advice giver! She has helped in so many ways. I am grateful for the progress she has helped facilitate ♥!!! …This entire experience has been incredibly positive as a result of her expertise. I have looked forward to my weekly sessions with her. Thank you! This could not be any more truthful. That is why next week on the Wednesday April 24th Petruzzello's in Troy we will be hosting The Benefits of Laughter. This will be the 4th Annual Senior Living and Learning Seminar. We are excited to see everyone’s smiling faces. For more info about this event please check out the link below.